Made from 304 stainless steel and ideal for addling larger amounts of hop pellets, flowers or spices to your Grainfather or RoboBrew without blocking the pump. It can also be used in your Brewhouse Kettle/Boiler, 19L Corny keg, Kegmenter or the Fermentasaurus. The fine mesh will prevent large particles from blocking the dip tube, pumps or chillers. It will hold approximately 150g of hop pellets, allowing for some space to permit full extraction of the hop oils. 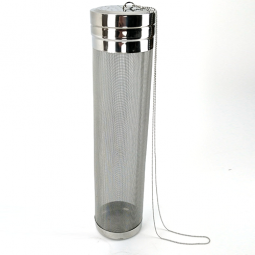 Ideal for dry hopping in the keg and can also be used for fruits, wood chips, spices and more. Includes a small ring so it can be hung from the keg lid or side of the vessel. Note: Does not fit a standard 50L Keg as the opening is not wide enough.